With the advent of the Left coalition that has come with a clear majority, the general feeling is that there will be stability in government for the next few years paving way for consistency in policy. With monetary policy in havoc and in the fiscal space with the macro-economy showing strains, the task of the new government in general and the finance minister in particular is daunting. 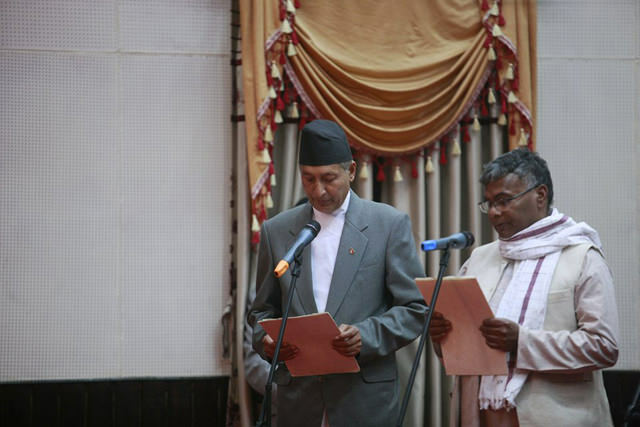 The step of the Oli government in choosing a technocrat like Yuba Raj Khatiwada as finance minister has been the first smart move of the government, and shows the importance given to remedying the present state of economic affairs. With mounting imports and deceleration of remittances leading to decline in the balance of payment and a current account deficit, both contributory negatives to the economy, Nepal needs to find a solution at the earliest. First of all, our obsession with revenue generation through unleashed imports needs a rethink. Last year, our agricultural product imports ironically surpassed that of petroleum product imports. A clear policy to encourage local industries with tax incentives and FDI would be a start. We import hundreds of megawatts of thermal energy at a substantial cost, instead, if we were to encourage solar farms that could produce half those imports at lower cost than the imported energy, we would be finding a solution towards import substitution as well. In turn, we would not only be producing clean energy, we would be demonstrating that we have an alternative energy policy in place as well instead of only being hydropower centric. However, with the recent announcement of Rs. 7.30 per solar unit as the purchasing price by the off taker, it becomes unviable for any investor to invest in solar energy, killing the initiative before it even sees the light of day. Perhaps it is time to look at the bottom-up approach by investing and encouraging small and medium enterprises (SMEs). According to the Department of Industries 86% of businesses are SMEs contributing 15% to the GDP and employing almost 2 million people. These SMEs can be the catalyst to Nepal’s development. They are characterised by traditional methods of production and management. All they need is capital and technical expertise to scale up. There are quite a few private equity, venture capital funds in Nepal now that are willing to fill that gap and invest with demonstrable impact in mind. Now is the time to encourage these investors to help local small and medium enterprises boost their productivity, export their goods, create employment and at the same time encourage them to be transparent and pay taxes. The need of the hour is for alignment between the Government’s vision and the private sectors expectation. Siddhant Raj Pandey is Chair and Managing Director of Business Oxygen.